A while back, I bought a folding firepit. I took it to Pennsic the year I camped solo and never used it - it seemed like it would be too much trouble to build and tend a fire just for myself. I've been wanting to get more practice in with campfire cooking, because at the site is not the best time to realize you don't know what you are doing and will be eating cold cereal for dinner. So I took the thing out to the back concrete patio, put some kindling in it, and lit it up. I had on-hand a sturdy pottery bowl with broth, oatmeal, cooked chicken, and vegetables. I covered it with an aluminum dish from my mess kit. I've cooked with this bowl before on Coleman stove and on charcoal, but not wood coals. I also put my lightweight cooking grate up, over the firebowl. Lesson One: Wind is a thing. My kindling was kiln-dried, and it wasn't raining, so I thought getting fire would be simple. And it wasn't hard, but the heat was going everywhere but up to the bowl! Lesson Two: Coals are hot. I burned about 12 sticks or so of 1" kindling to coals, then got rid of the cooking grate and put the bowl and its cover right onto the coals. I was worried the coals would go cold before the soup heated and the oatmeal cooked. NOT A PROBLEM. When I peeked under the cover after a few minutes, it was at a rapid boil. Clearly, this is why a tripod with adjustable chain is helpful to have. Lesson Three: Get two BBQ gloves. The bowl was hard to handle with just one - to get leverage, I just about put the dirty glove-thumb in the soup a few times. Lesson Four: Keep stirring! I stirred almost constantly once I saw how high the boil was, and I still got a layer of toasted/burned oatmeal on the bottom. On the other hand, the toasted oatmeal was delicious, so...? Lesson Five: Use a bigger bowl. I could have fit in more greens, and the bowl would have been easier to handle, if I'd used a slightly bigger one. As it was, the cooking bowl was the serving bowl, and so it was pretty much topped up. Lesson Six: Evidently, wood fire puts out way more soot than charcoal. The bowl was red and black before; it's all black now! I am doing science to the parsnips. There are eight samples in the fridge, based on conversations with Mistress Linette and Lord Faolan. Four use the upper part of the parsnip with the woody core removed. Four use the lower portion of the parsnip, intact. For the cored parnsip slabs: I smashed them with a mallet, per the original directions. This separates their fibers. They were placed in four containers and doused with: Smithwick's Red Ale, a 3:1 mix of Smithwick's and water; Ayinger Urweisse; 3:1 Urweisse and water. For the more slender parsnip 'tails': Cut into thin coins and soaking in the same four liquids. In small pot, boil smashed slab w/red ale approx 15 min, til tender. Use mortar and pestle to mash with butter and cooking liquid. Result: Too buttery start, good caramel flavor middle, but terrible bitter aftertaste. Rinse equipment, do again with smashed slab w/urweisse. No butter; liquid all absorbed or evaporated (despite lid on pot!) after 15 min. Result: No bitter aftertaste, but I didn't like the flavor much. The urweisse has strong clove notes and other flavors that I'm just not loving. Was the red ale too hoppy? Should I go for a brown or even a porter? Also: I tried a nibble of the raw parnsip in red ale. Not bad, although the raw parsnip was very astringent. Toss 4 groups of coins in oil and salt, roast 350 F 20 min in shiny aluminium pan. They were cut thin and cooked really fast! Red ale and urweisse + water seemed the tastiest, but there wasn't a big difference between the four groups. Toss the remaining pounded slices (red + water, urweisse + water) in oil and salt, roast 350 F 20 min in same pan. No major difference from coins in flavor, fibrous nature of parnsips were emphasized. Got some nice crispy straws though. Mashed parnsips are out; roasted parsnips are in. Cored, sliced into rounds, soaked and roasted, they retained some of the beery flavor but got a nice roasty vegetable flavor. My husband even ate them up, so score. I will probably use the urweisse for the dinner. If I weren't SO TOTALLY DONE with parnsip experiments right now, I'd do another round with a brown ale and a porter. I think the brown would probably be best. But my life needs to go on, so we will use the urweisse, tempered with a bit of water. Thank you, everyone who offered advice! One day, I want to try the near-vertical skewer arrangement shown here. But for today, I just threaded 1" cubes of NY strip steak onto soaked bamboo skewers and laid them down on a standard charcoal grill. Unsurprisingly, grilled steak bites are delicious! I'll keep an eye out for quality steak on sale over the next few weeks and lay in a store for the dinner. Crushed berries: Some flavor, rather sour, very pulpy/seed-y. You could give this as medicine, but it's not something anyone would want to drink. Crushed berries mixed with water: Water didn't help. Crushed berries forced through a fine sieve: This made some blackberry juice. The seeds and pulp were gone, but it was bland, watery, and sour. The Sieved Juice mixed with water: This was almost the best of the bunch? The berry juice sort of accented the water rather than trying to actually be a flavor. Which was good, because there wasn't much flavor. I've ordered a bottle of blackberry juice concentrate. Maybe that will work better. I bought some more parsnips. I'm going to try to follow the medical prescription more closely - pound the raw parnsips and soak in ale overnight. Then I'll try boiling them and making a further mash. Since I'll be firing up the grill for the steak, maybe I should do some baked apples and walnuts for dessert? I tried mashed parsnips with "ale" and flatbreads. Parsnips - These were... meh. Not gross, but not actually good. The parsnips didn't mash very well - kind of stringy texture. Part of the problem may have been the "ale" was an Oktoberfest that, upon close inspection, was labeled "Malt Liquor." Soooo... not really beer, then? What I did was boil the 'snips in the ale. I drained it off (didn't want the mash to be too wet), mashed them, and then added the cooking liquid back in. Butter helped the taste (because it always does). I am half-considering something like a cold carrot salad, with thinly-sliced 'snips in an ale dressing. Except the raw parsnips were pretty astringent, and tasted much more sweet and mellow after cooking. Flatbreads - The recipe was very enthusiastic about being "yummy!" ...if you find Scandinavian rye knäckebröd to be yummy, then yeah, sure. It came out as slightly thick, sort of bendy/soft knäckebröd. I used half bread flour (was out of whole wheat) and half rye. Added water, kneaded. I did some with less water, some with more; some thicker and some thinner. Water didn't seem to make much difference; thinner was better (cooked more evenly). It tasted of toasted rye flour and not much else. It's clearly a "carrier" food, meant to be laden down with something else (butter, a scoop of thick soup or pottage, fruit compote) rather than eaten for its own sake. I don't think I will serve these. We'll pretend we're a higher-status household with access to yeast-raised wheat bread and an oven. The radish dish, served either as an appetizer or a digestif. I tried this one - and lo, salted radish slices were easy and inoffensive. Honey Butter Beets - I sauteed beet greens (from one bunch of beets) in butter and drizzled with around 1 tsp honey. I didn't really taste the honey. Also, beet greens taste more like spinach than cabbage, which means I like them much better raw. Also also, they're rather expensive for the amount you get. I am thinking I will buy kale to make up the bulk of the dish (lacinato if I can find it) but put in one bunch's worth of actual beets. And more honey. Pepper-Wine sauce: I tried this two ways. First, 1.5 c red wine (pinot noir) with 1.5 Tb peppercorns, cooked down to 1/2 c. Then, a blend of red wine and meat drippings (about 1 c.) with 2 Tb peppercorns, cooked to around 1/3 c. Not sure the pinot was the best choice - the all-wine reduction was very sourish, not very wine-y. But it was very bright with acid, which is very much in the medieval sauce flavor family. (Most medieval sauces: Take these spices and/or herbs, blend with lots of vinegar, add oil and emulsify.) I did like the one with drippings, but I suspect the pure wine is more medieval. I could barely taste the pepper in either when I had it over beef, just got a sort of numbness of the tongue. When I put it over potatoes, the pepper came out loud and clear. Not sure if I should use more pepper or let it be. Also not sure if I want to do a baked roast or a pot roast. 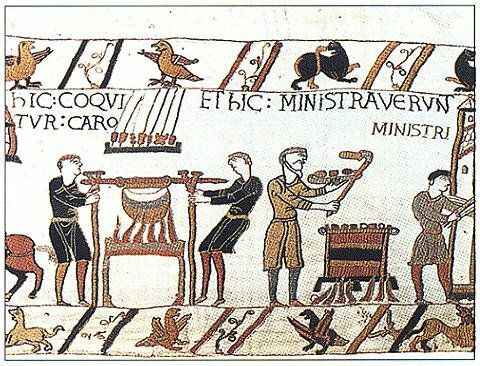 Or maybe skewers, a la the Bayeux Tapestry? Parnsips with Ale: Haven't done this yet. I wonder what the best beer to use would be? Bread: I want to try this recipe. I am kind of over crackery flatbreads; if these don't cook up more like pita-ish things, I may just go buy a nice sourdough loaf. 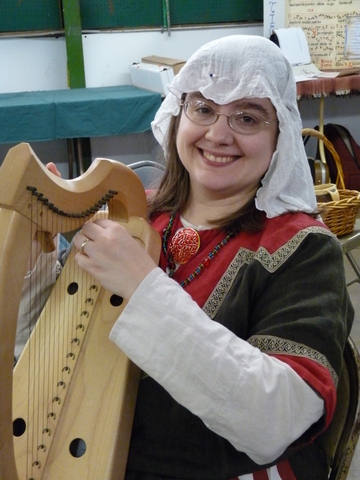 I'm teaching an Intro to SCA Camping tomorrow. Since it's been a while since I made a foil meal, I figured I should fire up the grill and test-drive my recipes for the class. I unexpectedly also learned more about charcoal cooking. I don't usually do outdoor cooking in all weather. Sure, wind and rain makes things harder, but... Matchlight charcoal, yeah? How hard can it be? I got my first set of coals lit, put the lid on the grill (yes, with the air holes open) and wandered off to chop vegetables. And when I came back, instead of nicely ashed coals, I had half-started coals. Apparently, lid on, holes open isn't enough air to catch the charcoal? Or else some of my initial coals went out. I did find that I had to use 2-3 matches to get it going instead of just one. So I learned more about charcoal grills today! Foil Meals: I bought thin-sliced chicken breasts and put them along with thin slices of potatoes, carrots, and onions into a two-layer foil packet with Italian dressing, just like old times. I know you're supposed to have more coals on the top than the bottom, but I think I had roughly equal amounts - but I planned to flip it halfway through anyhow, so it should have minimized any difficulties. 10 minutes chicken-side down, then 7 minutes potato-side down, and it was nicely done. A few potatoes were a little underdone, but they were edible. Bread: I left myself good notes from the last time, so this was more like a review than a pathfinder. Used King Arthur bread flour, about 12-15 coals under and about 20 over, for 50 min covered the whole time. Beautiful-looking loaf, first slice tastes okay although I'm not sure if I'm still smelling raw flour. Maybe should let cook for a full hour.